As the Northern hemisphere enters the summer season, it's the second year in a row that Samsung releases a rugged version of its incumbent flagship. This time around, it is a toughened take on an already IP certified device, so they went through the roof with military-grade protection against all kinds of extremities. 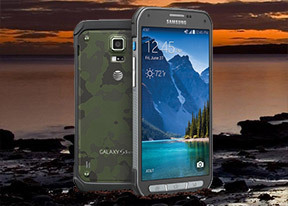 At least for the time being, AT&T can call the Samsung Galaxy S5 Active its own. The Samsung Galaxy S5 Active requires a lot less compromises than its predecessor. As capable as it was, the Samsung Galaxy S4 Active lacked the highly-praised Super AMOLED unit of its civilian sibling. It also packed a lower resolution camera (8MP as opposed to 13MP), thus denying its users two of Samsung's staples. In contrast, the newcomer features the exact same specs as the already well-known Samsung Galaxy S5. The only things missing are the microUSB 3.0 port and the fingerprint sensor. It has made way for more rugged navigation keys. And they're hardware buttons again, like on the previous generation. At a quick glance, the Samsung Galaxy S5 Active is everything we expect it to be - a toughened up version of the SM-G900. The gorgeous 5.1" Super AMOLED display is on board and so is the 16MP camera capable of 4K video recording. The beefed up dust and shock resistance surely is a welcome sight too. The same goes for the shortcut button on the device which can be utilized as a camera key. On the negative side, the S5 Active suffers from mostly the same niggles as its regular sibling. They include poor video codec support out of the box, lack of OIS in the camera, and the presence of a single mono speaker. Pundits will also point at the lack of fingerprint sensor, though we reckon that its absence is offset by the presence of more comfortable and sturdier, navigation buttons - ones you can press even with safety or work gloves on. The limited availability of the device is surely an issue too, though we are certain that a globally available version is quite likely. As always, we are going to kick the review off with unboxing, followed by our take on the design and build. Head over to the next page to find out what the S5 Active is like in the flesh. I hate s5 active.2 big problems. The buttons stick out too far so it pocket dials. The proximity sensor is poorly located so it doesn't turn the screen off when talking on the phone. It opens many apps while talkung.